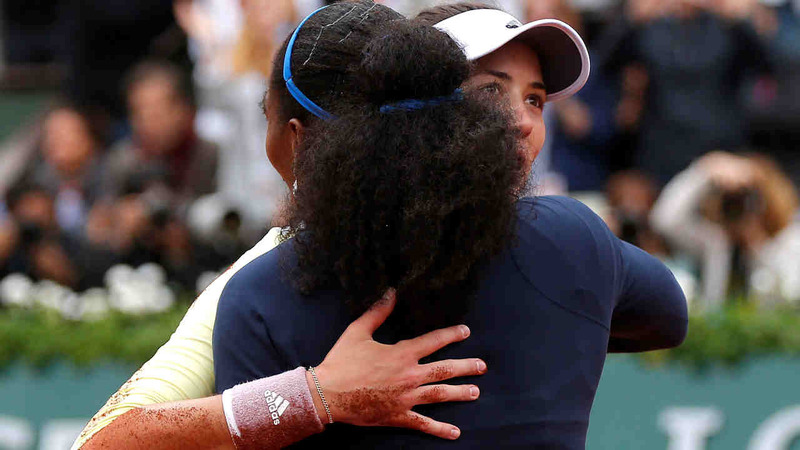 PARIS -- Garbine Muguruza won her first Grand Slam title by beating defending champion Serena Williams 7-5, 6-4 at the French Open on Saturday, denying the American her record-equaling 22nd major trophy. Muguruza also managed to deal with Williams' dangerous serve, breaking three consecutive times from late in the first set to early in the second. This was Muguruza's second major final; she lost to Williams at Wimbledon last year. But Muguruza has won her past two matches against Williams on the clay of Roland Garros, including in the second round in 2014. For Williams, whose timing was not exactly right much of the afternoon, Saturday's loss delayed yet again her pursuit of matching Steffi Graf with 22 Grand Slam singles championships, the most in the Open era, which began in 1968. Margaret Court holds the all-time record of 24. Williams got No. 21 at Wimbledon in 2015, her fourth major title in a row. But since then, she has been beaten in the semifinals at the U.S. Open by Roberta Vinci last September, in the final at the Australian Open by Angelique Kerber in January, and now by Muguruza. This is the first time in Williams' career she has lost back-to-back Grand Slam finals. This year's visit to Paris hardly could have started off more inauspiciously for Muguruza: She lost the very first set she played in the tournament, against 38th-ranked Anna Karolina Schmiedlova. Muguruza won the prematch coin toss and let Williams serve first, a fascinating choice given that Williams is widely regarded as the best server in the women's game, perhaps ever. And the decision seemed only more dubious as Muguruza managed to put the ball on play on only one of the first six points Williams served. On one early point, Muguruza whiffed completely on an attempted backhand return of an 89 mph (143 kph) high-kicking second serve. And yet, it all wound up working out. And how. Muguruza broke a total of four times, twice in each set. After saving two break points herself to get to 2-all, Muguruza nosed ahead first, when Williams combined three errant backhands with a double-fault to hand over the lead. An additional dose of confidence arrived in the next game, despite beginning with two-double faults to create a love-30 hole. Muguruza quickly pulled herself out, taking the next four points to go up 4-2, capped by a down-the-line forehand winner on the 11th stroke of the exchange. Muguruza won all six points of 10 shots or more in that opening set and, indeed, there was no junkballing on this day. Both women hit hard, quite hard, trading bold forehands and backhands from the baseline. Seemed unfair to characterize nearly anything as an "unforced error," considering the way each made things so tough on the other. But it was Williams who had more difficulty putting shots right where she wanted, an unusual sight. She wound up with 39 forced errors, 18 more than Muguruza. Still, Williams broke to 4-all, and they were at 5-all when Muguruza regained control. She hit a backhand winner, then drew two miscues by Williams. When Muguruza smacked a backhand winner on her third set point, she was one set from the championship. She then broke in Williams' next two service games, as well, enough of a lead to make her first seriously significant shakiness - three double-faults in one game, including on the last two points - to become irrelevant. Muguruza held four match points while leading 5-3 as Williams served. But it would not end right then and there. Williams, resilient as they come, staved off the full quartet, forcing Muguruza to try to serve for the victory. And that she did, converting her fifth match point, the last she would need, with a delightful lob that landed right on the opposite baseline. Maybe stunned by that shot, maybe stunned that she was now a Grand Slam champion, Muguruza turned toward her coach and other supporters in the stands with a blank expression. Soon, she was flat on her back, caking her dress and arms with the rust-colored clay she will never forget.